NDP headquarters building- what will it be? 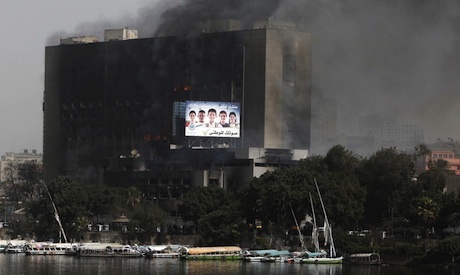 Prior to the January 25 Revolution, the former National Democratic Party (NDP) headquarters, bordering Tahrir Square and the Cairo Museum, once stood as a symbol of the Mubarak regime. Now that is burnt down and black smoke stains cover its walls, although unpleasant, the site is now a symbol of Egypt’s glory. If we were to change the NDP headquarters building, what should it become? Basma El-Husseiny, founder and general director of an artistic non-profit organisation, Al-Mawred Al-Thaqafy, says that a few weeks back one of the Egyptian daily newspapers quoted a statement of the head of the holding company of tourism in Egypt. He said that his sector would make use of the building’s great view of the Nile by turning it into a hotel. “A ridiculous statement,” El-Husseiny said. “The NDP headquarters stands witness to what happened in Egypt,” she told Ahram Online. “The building should become an annex to the Cairo Museum,” she suggests, commenting that the NDP building should become a politically historical museum. “Part of the building should be restored while the rest of it, plus its halls, should be dedicated to the revolution, martyrs, and the recent history of Egypt,” El-Husseiny said. She highlighted the importance of educating the young generation about recent Egyptian history and not having it purely as a tourist attraction in Cairo. Talks about changing the building have been widespread since Prime Minister Essam Sharaf was reported to have plans of transforming the building into a national human rights watch headquarters. Until today nothing regarding the matter has been officially announced. The idea of converting the burnt building into a national museum is common among many artists. Painter Mohamed Abla told Ahram Online, “The entire building should become the January 25 Revolution Museum and Cultural Centre.” He explained that restoration works should be carried out on the NDP building, with a cultural centre inside for film screening, seminars and art galleries. Agreeing with Abla were visual artists Hamdy Reda and Mohamed Mekawy. Reda, founder of Artellwa, believes that the building was initially a cultural centre before it was taken to become the headquarters of the political party back in the 1970s. “Yes it is important to have a museum inside that documents the revolution that took place, but the building should go back to its initial status,” he told Ahram Online. Unlike Abla, Reda sees having a cultural centre that documents Egypt’s history as more important than having a museum. Reda suggests, “As a cultural centre, it should have galleries, workshops, public libraries, and theatres. The size of the building means it could hold a number of history halls that talk about the revolution, martyrs, etc.,” he says. Mekawy, however, would prefer the museum to document the dictatorship of the old regime and how the Egyptians made it to freedom. “It is a significant period in Egyptian history that needs to be historically recorded,” he says while emphasising also that only a part of the building should be restored, so as to keep the historical evidence of the January 25 Revolution alive. The idea of a creating a cultural centre became more apparent, the more Ahram Online researched the topic. Visual artist Adel El Siwi suggests, “The building should be reconstructed in glass. Transparency is a symbol of truth, carrying the message that there is no more hidden information.” In his modern architectural design, El Siwi envisages the building as a centre for all performing arts. Cartoonist Ahmad Nady hails the idea of a centre that holds cultural activities. “It should be a place for workshops of all artistic fields inviting all artists from all over Egypt,” he says. Theatre director Hany El Metennawy says, “It should be a big and well equipped theatrical venue that holds rehearsal rooms and a number of stages for independent and not the state-funded theatres. It can also include other art forms since theatre is the backbone of all art forms,” he states. A couple of Egypt’s young artists, including political cartoonist Ganzeer and filmmaker Ahmed Abdallah seem to have another vision for the headquarters. Both agree to have it completely torn down. Although no official statements have been made yet, regarding the structure, this idea would comply with the information provided by the Cairo governor; that the degree of damages will make repair impossible. Ganzeer suggests, “The entire area should be a beautiful landscape overlooking the Nile.” He argues, "From an urban planning perspective, one can't have a building so high in front of the Nile since it obstructs the view." Praising the idea, Abdalla told Ahram Online, “An unfenced public garden should be in place. Cairo’s downtown area lacks greenery, so it would be better if we provide landscape to it,” he says, mocking the established public gardens that require a guard and a symbolic entry fee. Abdallah’s garden would be free of charge of course! Like the artists of Egypt, you too can have your say below. Replace [the ruined NDP building] with a green space and a speaker's corner- liberated by and for the people! It definitely should be a garden. We have very little greenery in Cairo and it is too ugly a building to restore..